Soon the festival of Shavuot will be upon us. The Harvest Festival, in which we read the Book of Ruth. On Shavuot we gather that which we have sown, and reap that which we have labored on throughout the year. And so I chose this moment to think with you about the Book of Ruth and poverty through the photography of Adi Nes. Israeli artist Adi Nes created a series of staged photographs that make the connection between Biblical characters and modern-day society, two of which involve Naomi and Ruth. In this photo, called “(Untitled) Ruth and Naomi Gleaning”, Nes refers to the period of poverty facing Ruth and her mother-in-law in Yehuda, when they are forced to glean the left-overs of food from the field. These leftovers are deliberately put there by Boaz, owner of the field. This is in accordance with the socialistic law of gleaning, the forgotten and the edges, which asserts that the owner of a field must leave behind the sheaves that have been missed in the harvest, for the needy. 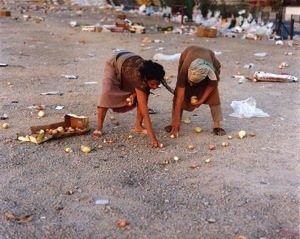 In the photograph there are two women, one young and one older (judging by their arms), picking up discarded onions from the ground of what might have been earlier on in the day a bustling vegetable market. Apart from a plastic bag that can be seen – this is a scene that could have taken place at any time in any place. I would suggest that in this way Nes hints that poverty exists in every society, in every period, everywhere. According to the Book of Ruth, two things save these two women: socialistic mitzvoth made law, and Boaz taking personal responsibility. Although according to Levirate marriage customs Boaz should not be with Ruth, marries her out of a sense of obligation as a close relative of her deceased husband. Ruth’s marriage, and the birth of heirs to his more respected family, saves Naomi and Ruth from a life of poverty and itinerancy. In contrast to the easier image from the Book of Ruth, of young Ruth gleaning in the pastoral fields, the photograph of Adi Nes presents us with two poor women, young and old, gleaning amongst the discarded refuse of a market. The contrast between these two images emphasizes the attitude to poverty today. Nes calls us to look at the differences, and to take responsibility for the poor among us – both publically and personally.